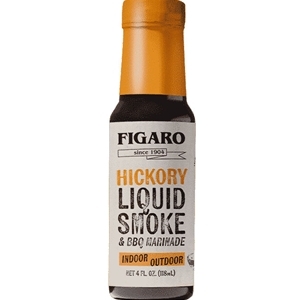 Indoors or outdoors, the delicious taste of Figaro Hickory Liquid Smoke will add a perfectly blended balance of authentic, slow-roasted hickory barbecue flavor to all your meats! 4 fl. oz. Water, Hickory Smoke Flavor, Vinegar, Hydrolyzed Soy Protein, Sugar, Caramel Color, and Spices.